Renowned for its softboxes such as the Ezybox and reflectors such as the TriGrip 1-stop Diffuser, Lastolite also carries many smaller useful accessories in its expansive range of products. 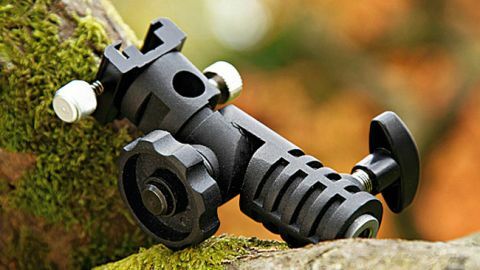 These include the Hotshoe Tilthead, which enables a standard flashgun to be mounted on a stand and set to one of 13 positions over a 180-degree angle. The top of the Lastolite Hotshoe Tilthead features a standard hotshoe fitting that can be adjusted with a side screw to accommodate different flashguns. Directly underneath this, there's a socket for umbrellas, while at the base of the unit a small threaded metal lug screws into a standard floor stand. While small and light, it feels as though the Tilthead is nevertheless constructed to a high standard. Mounted flashguns are securely held in place thanks to the adjustable side of the hotshoe, although the tiny spring around the screw is easily lost if you unscrew it too far and it falls off. The ratcheted design of the central portion means that each adjustment can be easily noticed, and even when the screw is untightened, this section can only be moved when pressure is applied. The flash is, therefore, in no real danger of swinging down and falling from the stand. When turning the central screw that controls this adjustment, though, it's all too easy to chafe your thumb on the uppermost screw. When you consider that most flashguns offer a tilting control, the usefulness of the Tilthead's main function is debatable, although it does at least broaden the positions available to you, and its umbrella socket is useful addition. Its sub-£20 asking price is also reasonable when its build quality is considered.